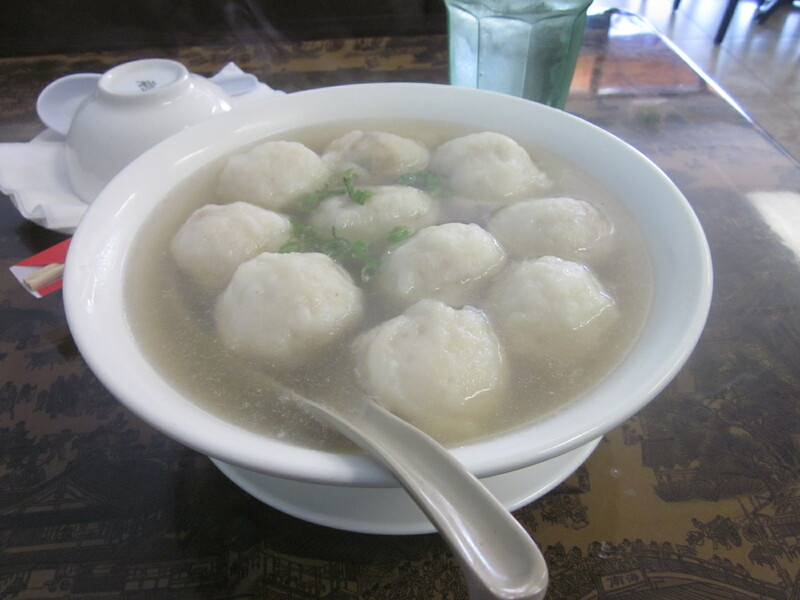 This is pretty much the nicest Fu Zhou fish ball I’ve had in Los Angeles. 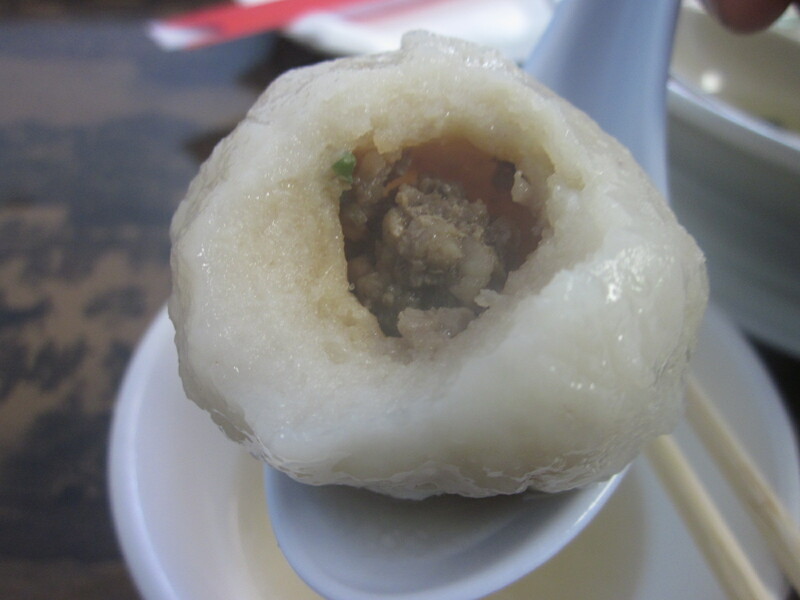 Fu Zhou fish balls are oddball constructions – fish paste for the outside, (sometimes curried) ground pork on the inside. When they’re bad, they’re like those rubber bouncy-balls you had as a kid, with a gritty dry center. But these are good ones: kind of fluffy-cloud-captured-in-slightly-bouncy-form on the outside, and juicy on the inside. They’re sort of ike those beloved Shanghai juicy dumpling, xiao long bao, but a touch heftier and brawnier in the insides. Some of the ones I’ve had practically generate their own curry inside. If good xiao long bao are like little delicate skeins of nice broth, these are like clouds filled with gravy and some goddamn pork. More country, more funky, and more profoundly weird. Xiao long bao are very distinctive, very precise. The ones at Din Tai Fung have those sharply al dente outsides, then the gush of hot liquid, then the center. These sort of… meld. The layers are completely different, but the edges are blurred… the fish paste is so soft and moist that it sort of melds into the inner soup, and the inner soup is so intensely flavored that it sort of drifts into the meat, and it’s just such a beautifully *weird* experience. Look at that beautiful thing! Freaking bowl of nothing but fishball! I ate ’em till I was sick! And then I had more, because I couldn’t let that beauty go to waste! Also, people on the Atkins diet or Paleo or whatever would probably kill for these. They’re meatballs wrapped in whipped fish, for chrissakes. Not a lick of English spoken here, but the menu has some gloriously screwed up English, and they were gracious enough with all my excitable pointing and flapping. Thanks to Chowhound’s PandanExpress for the tip-off. This entry was posted in Uncategorized and tagged Chinese, Food, San Gabriel by C. Thi Nguyen. Bookmark the permalink.